The quality of the cut you get from a miter saw largely depends on the foundation it operates on. The good miter saw stands provide a solid foundation that keeps your miter saw in a rigid position without compromising portability. The world of miter saw stands isn’t an all-promising one. It has got different choices that range from the good, no so good, to the downright flimsy. This makes selecting the best miter saw stand a little bit tricky. Choosing the right stand means taking into consideration the various aspects of portability, versatility, capacity, ease of use and durability. And it doesn’t end there since there are some extra features that need to be factored in. In short, you need to know what you’re looking for. Fortunately, you’ve come to the right place where I’ve got all the recommendations already done for you. Without further ado, here are the top 10 best miter saw stands that will make your woodworking job even more rewarding. This stand combines easy rolling wheels and fold-up design to provide easy jobsite mobility. It can be lowered or raised via a pneumatically assisted mechanism to help you set the stand into three different positions. The stand comes in a tubular steel construction that’s durable and sturdy yet still manages to stay lightweight. Such a sturdy provides a weight capacity of 300 pounds. Mounting rails come in handy to make this stand compatible with almost any miter saw on the market. Armed with adjustable infeed and outfeed supports, the stand accommodates up to 8 feet of workpiece. You can choose to fold the stand when not in use to save space. This stand takes compatibility to a whole new level. It sports a universal design that works with all miter saw brands. The heavy duty aluminum construction expands its usage possibilities and provides lightweight portability for easy transportation. 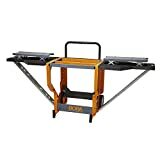 A 5.5-foot beam backed with adjustable extensions provides support for up to 16 feet of work materials. The stand easily snaps to assume a space-saving folded design. It works with materials weighing up to 500 pounds. The construction of this miter saw stand can only be described as super light. Even with the additional of mounting brackets, it still manages to be one of the lightest miter saw stands on the list weighing a mere 15.4 pounds. That makes it much easier to transport. Not only is this stand the lightest, but it also takes the most weight having a weight capacity of 1,000 pounds. The legs are fitted with easy sliding feet that provide effortless movement by reducing friction. This stand folds for compact space-saving storage. 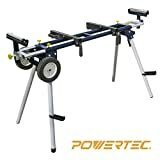 Those on a tight budget might want to get their hands on this miter saw stand. This is a heavy duty stand that performs way beyond its price tag. It has the strength and durability of a heavy duty steel construction that’s powder coated for extra protection. This is a stand for the big jobs involving materials that weigh up to 500 pounds and measuring 10 feet long. Quick attach mounts come in handy to give you an easy time during transportation. One good thing about this stand is that it’s upgrade-able to provide a more stable job maneuverability. 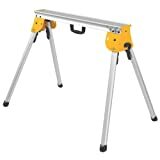 To the untrained eyes, this miter saw stand looks more like an imitation of DWX725B. However, there’s some slight differences to them. This stand comes without mounting brackets and it’s a little bit heavier at 29.8 pounds. Such a construction still earns it a place in the lightweight category providing easy transportation. It’s a compact, space-saving stand that still manages to support materials up to 10 feet. Weight capacity doesn’t disappoint either since the stand can support up to 500 pounds for big job applications. 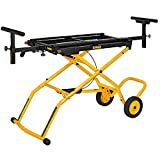 This stand comes in a wheeled design to provide easy mobility around the jobsite. It truly takes a beating with its heavy duty steel construction that’s powder-coated to withstand the elements. 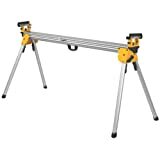 The stand is especially a perfect choice for those planning to own the 12-inch sliding compound miter saw. You get tool-free height adjustment for easy material support and quick setup. The stand supports workpieces measuring up to 8 feet and has adjustable stops that come in handy for repetitive cutting. It has a weight capacity of 400 pounds. 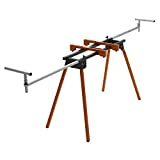 If you don’t need mounting brackets in DWX725B miter saw stand, then this might just be what you’re looking for. The lack of mounting brackets make it the lightest miter saw stand on the list. But that doesn’t mean it lacks the toughness needed in big jobs. This stand supports a whopping 1,000 pounds of material to handle the toughest jobs around. It folds quick and easy to store nicely while saving lots of garage space. Here’s an ultimate workstation that eliminates the need for being near an electric outlet. It’s got its own 110V power outlet to take care of that. The stand provides the lightweight construction and strength of a tubular frame. With it, you get a maximum material support of 330 pounds. Smooth rolling rubber wheels make transportation less of a hassle. The legs are fitted with a spring-loaded mechanism to make setup and breakdown quite a snap. There are two rollers that provide a smooth feed. 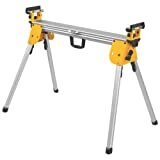 This stand works with most 10-inch and 12-inch miter saws. This stand comes in a 2-winged design to provide that additional stretch needed to support larger work-pieces. The wings can be folded either up or down to give more room or assume a compact space-saving size. The height is adjustable to create a more leveled setting. With an all-metal frame and cross-brace design, you get reliable durability and stability free of any wobbling. The base is fitted with four 3-inch casters for ease-of-movement within the work area. Portamate PM-8000 has everything you want in a miter saw stand. That doesn’t come as a surprise since it’s the most expensive stand on our list. And when we say expensive, this miter saw stand is worth it. It’s a quality stainless steel workstation that comes solid to eliminate any wobbling or movement as you work. The stand has 2 wing stations that unfold to give an additional 60 inches of support. The wings flip back when not in use to provide compact storage. Wheels are included for easy transportation. You get all these functionalities in a lightweight construction that you can handle with ease.